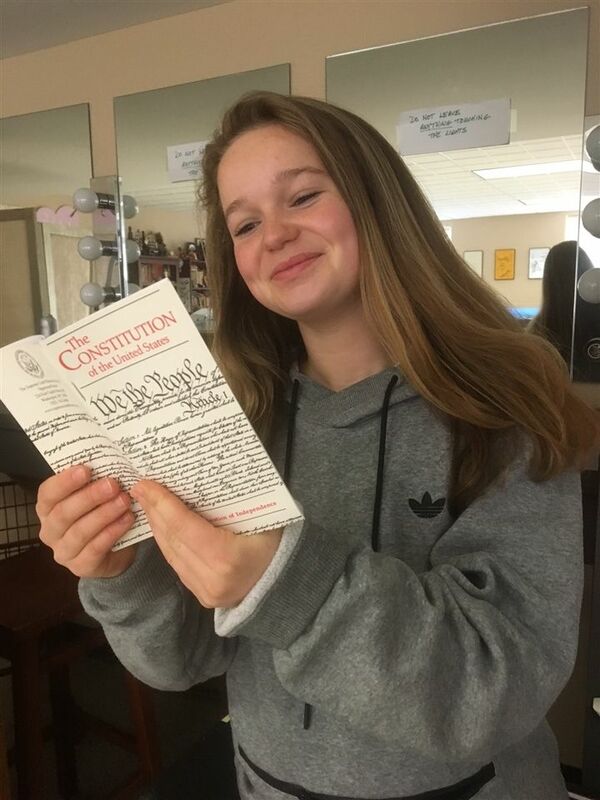 Eleanor Doolittle ’20 indulges in some light reading of the U.S. Constitution. Don’t you love a republic? Don’t you love the idea that every person has an equal voice in electing officials, on both a local and national level. Well, as you study the United States Constitution this year through the Calarco Library program, “Reading The Constitution,” you may discover that the U.S Constitution has a little surprise for you. The United States government operates under a constitutional republic, in which figures of power have to rule within a certain document, in our case, The Constitution, and power is divided up into different branches. Although this document is the cornerstone of American democracy, many people do not know what this document includes. This year the Calarco Library put together a year-long program to help familiarize our community with the document, which as put by 21st Century Democracy teacher and Assistant Head of School John Roberts, is the “single most important document and fundamental piece of American politics and government.” The first, and main event of the Constitution program this term was on September 29, when Akhil Amar, Sterling Professor of Law and Political Science at Yale University and an expert on Constitutional law, spoke to the student body about the Constitution and its significance in American politics today. He spoke about how the Constitution is a living document, and there are different ways to interpret the meaning of a certain phrase within it. Amar used the example of a President having to be a natural born citizen. He questioned: could the President not be a Caesarean-section baby? And what if he was born outside of the United States, but one or both of his parents were citizens? After the event, free, pocket-sized copies of the Constitution were made available in the Upper Library, Thompson Hall, and Heath. In the months after Amar’s speech, the October theme was “US Constitution in the News,” celebrated through a newsletter sent to the faculty, students, and staff featuring links to a series of ongoing Supreme Court cases. For November, Hopkins hosted the exhibit “Emancipation and its Legacies,” a series of poster boards about the 13, 14 and 15 amendments, on loan from the Gilder Lehrman Institute of American History. The exhibit was in the Upper Library through November 28. December’s theme was “Our Bill of Rights,” celebrated again with an informational newsletter sent out to the entire community. When Prendergast was asked which event she thought the students would like most, she responded with, “the mock trial we are working on,” where she hopes to “have some Hopkins alums who are currently in the Yale Law School come and do it.” This will continue to further the Hopkins community’s understanding of the Constitution and its significance in our modern political climate. Copies of the Constitution can still be picked up, for free, in the Upper Library!